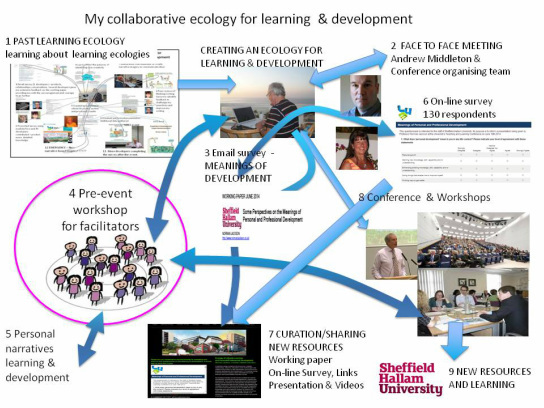 A learning ecology comprises the processes, contexts, relationships, networks, interactions tools, technologies and activities that provides us with opportunities and resources for learning, development and achievement.1 2 A learning ecology is formed around a purpose which stimulates the needs, interests and responsibilities that drive our will. Our learning ecologies are the means by which we connect and integrate our past and current experiences, learning and development. They embrace all the physical and virtual places and spaces we inhabit in our everyday lives and the learning and the meaning we gain from the contexts and situations that constitute our lives3. They are the product of both imagination and reason and enacted using all our capability and gaps in knowledge and skill required to achieve our purpose are addressed through the learning ecology. They are one of our most important sites for creativity and they enable us to develop ourselves personally and professionally in all aspects of our lives. Organised educational settings provide ecologies for learning into which learners fit themselves but outside formal education settings self-created learning ecologies are essential to the way we learn and develop in work, family and other social settings. Recent European Foresight work envisions a future of learning that is lifelong, lifewide and open with increasing emphasis on the informal, the personal and collaborative nature of learning and achievement supported by abundant open learning opportunities. Our ability to create our ecologies for learning and development is perhaps the most important capability we need for sustaining ourselves, achieving our purposes and maintaining our sense of wellbeing in a complex, ever changing and often disruptive world. The presentation will examine the idea of learning ecologies within the context of lifewide learning and development and consider the relevance and value of these ideas for student learners and teaching professionals. 1 Jackson, N. J. (2013a) The Concept of Learning Ecologies in N Jackson and G B Cooper (Eds) Lifewide Learning, Education and Personal Development E-Book. Chapter A5 available on-line at: http://www.lifewideebook.co.uk/. 2 Jackson, N. J. (2013b) Learning Ecology Narratives in N Jackson and G B Cooper (Eds) Lifewide Learning, Education and Personal Development E-Book. Chapter C4 available on-line at: http://www.lifewideebook.co.uk/.